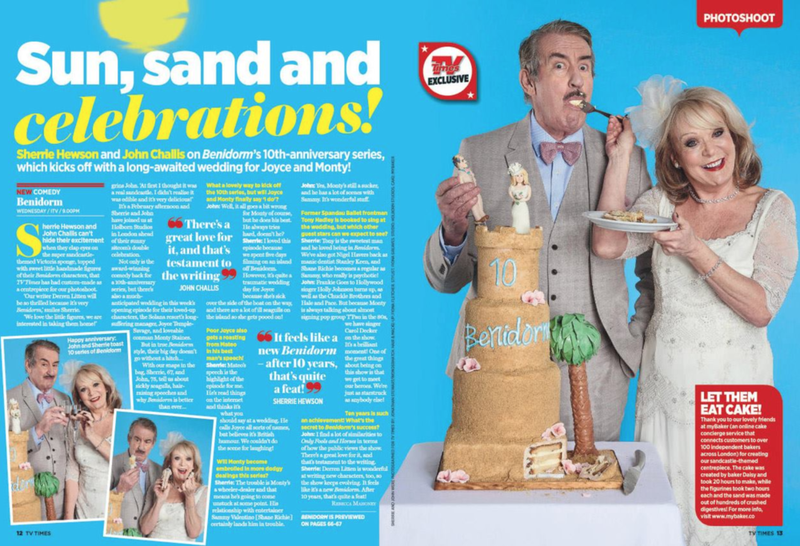 We were asked to make a sandcastle cake for TV Times for the 10th Anniversary of Benidorm with John Challis and Sherrie Hewson. Daisy was asked to create an 8ft gingerbread replica of The Truman Brewery Chimney to mark the first Christmas Foodies Festival at the London Landmark. - Click on the photo to see the full article. Daisy was asked to create a 1/2 ton replica of of the new Princess Royal grandstand at Cheltenham Racecourse. Princess Anne cut the cake and opened the new stand. The cake fed roughly 3500 people. Daisy created cakes for each of the X-factor judges to mark the start of the live shows. Louis Walsh was snapped carrying his out of the studio after the show.